Want to give some one a windscreen as a gift but don't know what their taste in design or color is? Not a problem, just give them a Kappa Windscreens gift certificate. 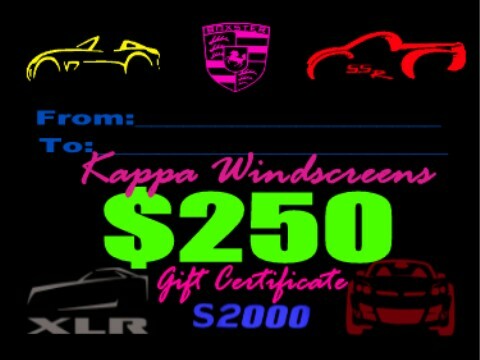 Available in $150, $250, $350, and $450 levels, the recipient of the coupon simply contacts Kappa Windscreens, picks out a screen and sends the coupon to us to receive credit for the purchase. The screen is then built and delivered to them. A great way to give a unique, custom gift to the roadster lover in your life.